Home » Tech and Design » Saving time: To code or not to code? Saving time: To code or not to code? From spending two hours programming your universal remote to power on all 3 home theater devices, to creating a website from scratch that coordinates your neighborhood pot luck party, we all try to automate some tasks in our lives in order to make them easier and more efficient. In the office environment tech people are often met with the demand to make their client’s tasks easier. The goal is to make a single button that accomplishes a complex or menial task so that the office worker can take their new-found spare time and concentrate on other complex or menial tasks–which in turn will require more single buttons that fix those. In essence, monetary resources are put towards hiring a tech person to automate tasks. The clock starts when the client goes to the tech person and asks for a new button. Maybe there is an hour-long design meeting. The tech person then figures out if a script or application can be coded. Sometimes new software is purchased. The solution is then put into place, bugs are worked out, and the office worker is happy pushing a button. Until it breaks. There was an API change or software update requiring the tech person to fix it. Then the requirements change. Clicking a button is so easy, the office manager wants more functionality. Not only do they want a spreadsheet, but they want charts automatically generated and sent to department heads across the entire manufacturing division. The job that was once an office job occurring once a week has now become an IT job demanding full-time attention several times a month. But the question is: Was it worth it? 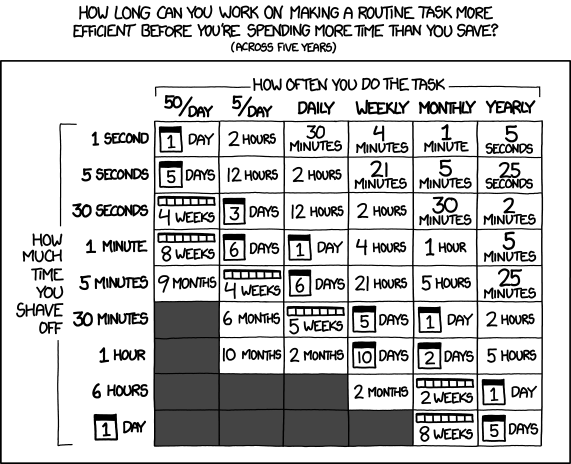 In order to use Randall’s chart properly, an individual must figure out how much time they spend on a task from start to finish. (Opening email and finding all new customers reported by a sales agent. Then print it out and hand enter into a spreadsheet = 5 minutes.) The individual then needs to figure out how frequently they perform that action (about 5 times a day). By using the chart a task with a 5 minute duration that is performed 5 times a day can shave off 4 weeks over 5 years (the chart does the calculation over a five year period). That seems considerable. Also note that the chart goes by human hours (24 a day) rather than work hours (8/day). Four human weeks is equal to 16.8 forty-hour work weeks (which is equal to 0.58 dog years). However, remember if more than one person (or dog) is working on a task that increases time units spent (2 people for 1 hour = 2 hourly units). Now comes in the cost of automation: IT time. Suppose the office tech spends a day or two coding the solution, and things remain relatively unchanged with low maintenance over the next 5 years. Automation was certainly a benefit. Don’t forget to include time spent at design meetings, research, coding, testing, etc. Again, remember that when more than one person is present at a meeting that increases the number of hourly units spent at that meeting. That’s all well and good for daily tasks, but what about those annoying, infrequent tasks that people want automated? The quarterly reports, the annual coordination of cleaning out the office fridge? Suppose the quarterly reports take six hours to prepare and are done eight times a year (you’ve always got to offer a pre-quarter-end status update before the official end of the quarter, right?) Well, if you assign IT time to come up with an automated solution, hopefully they spend less than 8 days to create and maintain a solution over the next five years. Five years is a long time to keep something around–unchanged. Metrics are always modified, requests and expectations change, and new features are requested. My advice is to tackle the substantial items, those that have a long duration with an increased frequency. Also focus on the ones that don’t change often. That boring task that has remained unchanged for six years is a great start. Finally, don’t discount the gains of boosting employee moral, consistency, and customer service improvements provided by an automated solution. People do spend time thinking about boring tasks and coming up with unproductive ways to procrastinate. Unproductive distractions count against the task as well. Just be sure your three minute annual task isn’t causing IT to spend more than 15 minutes coming up with a solution, especially since you probably already spent 10 minutes explaining what the problem is. Don’t forget, it takes at least two to have a meeting already putting the project time in the hole by five minutes. « Previous: Do you know what your browser extensions are up to?